With these Danner Men's 69210 Black Acadia Insulated Waterproof Uniform USA-Made Boots, you're assured of protection from the elements whether you' re a Secret Service bodyguard, a Security guard, or a cop on the beat. These 8-inch shoes are Marine Corps approve ... (see full details) (see specifications) #DNN69210. With these Danner Men's 69210 Black Acadia Insulated Waterproof Uniform USA-Made Boots, you're assured of protection from the elements whether you' re a Secret Service bodyguard, a Security guard, or a cop on the beat. These 8-inch shoes are Marine Corps approved. The uppers of these uniform boots are manufactured of guaranteed waterproof full-grain leather and heavy-duty 1000 nylon. Full-grain leather includes the outer portion of the hide, and it's the sturdiest part. This nylon is lightweight (you don't want to be weighed down in a chase) and resists tears and abrasions like no other fabric of its kind. Your comfort is taken into account with this American-made footwear which has a smooth lining that wicks away dampness like a blotter. A second layer of protection was added to these insulated boots, (to keep you guarded against the rain and snow) with a Gore-Tex layer surrounding your feet, so that perspiration can get out, and exterior water can't get in. These premium shoes have 200 grams of Thinsulate insulation, which uses tiny microfibers to trap your natural warmth and reflect it back to you. This much Thinsulate in the black boots should keep you comfortable down to -40 degrees Fahrenheit without you having to jump up and down like a kangaroo to improve circulation. Using a stitchdown construction, Danner has developed insulated footwear you can trust. 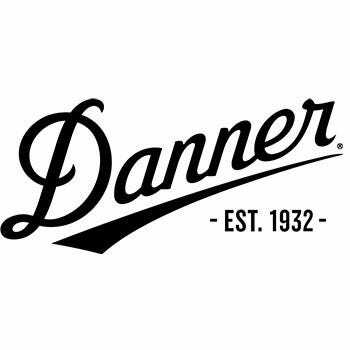 Thanks to this unique construction, they can even be redrafted at Danner's Portland factory if you need it. The lace-to-toe design gives you a secure fit, so you can put this abrasion-resistant shoes on in a hurry, polish them up quickly, and get going to your tactical adventures. This footwear is equipped with airthotic footbeds which are a half-length, molded polyurethane insteps that cup your heels and supports the arch area of each foot. More rigid than foam footbeds, the raised arch support won't compress over time, and it's perforated for improved air circulation and comfort. These boots have Vibram soles that can be repaired and deliver a good balance of traction and stability. The Vibram Kletterlift outsoles will give you plenty of traction and stability over any rugged terrain. You'll also get excellent shock-absorption, along with lightweight comfort. With the Danner Men's 69210 American-Made Black Arcadia Insulated Waterproof Military Boots, made here in the USA, the toughness keep going. So go ahead and add a pair to your cart today. These boots are among the best I've ever had---good fit. The vibram soles wear out way too quickly, and the gore tex liners will leak eventually. The rather high purchase price of these boots and their high cost to repair means I'll be looking for something else. I have a pair that I've been wearing for the past 4 years and they're without a doubt the most comfortable boot I've ever owned. Once a year I take them in to get reconditioned and resoled, for about 40 bucks a pop, but it's definitely worth it as I believe I can get at least another 3 to 4 years out of them. Not a bad investment don't you think? Alright men, listen up. The Danner 69210 is a good fitting boot, well made, and you can't go wrong with it. 24 out of 25 people found this product review helpful. I have been a police k-9 handler for years and will not wear any other boot. I have purchased 2 or 3 pairs of Acadias since 1993. These boots offer me comfort and protection when tracking through rough terrain. I often walk through shallow ditches of water or streams and my feet always stay dry. I have had each pair of my boots resoled at least twice. I do not think anyone can go wrong buying the Acadia. Danner Boots: Men's Black 69210 Insulated USA-Made Waterproof Acadia Work Boots is being added to your cart.